The evidence for black holes often seems confusing to the general public. On the one hand scientists say that a black hole is an object of such great density that not even light can escape it. This leads to the question of how we can observe such a thing if it doesn’t emit light? The answer scientists give is that black holes are a source of intense energy, driving things such as quasars and galactic jets. This apparent contradiction has led some people to reject that there is any evidence for black holes at all. Supporters of the electric universe models go even further, and claim that things like quasars and jets are due to pinched electric currents or similar phenomena. But in fact a black hole being both dark and bright isn’t contradictory. As an analogy, imagine if a famous actress such as Scarlett Johansson were to walk down a busy sidewalk. Pretty quickly a crowd would start to gather. There would be a clamor for her attention, requests for autographs and selfies. The gathering crowd would be quite loud, even if Ms. Johansson never says a word. If we were to see the shouting crowd from a distance, we could deduce that something is drawing the crowd together. If we also hear shouts of “It’s Scarlett Johansson!” “Can I get your autograph Miss Johansson?” and “We love you Scarlett!” we can deduce that the actress is the cause of all this commotion, even if we can’t see her directly. It’s possible that the crowd could be mistaken, and it is just someone who happens to look like Johansson, but if have other points of evidence such as the fact that she’s filming a movie in town and she just tweeted about leaving a restaurant a block away, we can be fairly sure it’s actually her. A similar thing occurs with black holes. By itself a black hole doesn’t emit light, and the only way we would detect it would be by gravitational lensing or the orbital motion of nearby objects. But often black holes exist within the centers of galaxies, where there is lots of nearby gas and dust. As this material tries to move closer to the black hole, it heats up and ionizes, which can create things like a plasma accretion disk that can emit intense x-rays and gamma rays. The currents of this accretion disk can also generate strong magnetic fields, which in turn creates one of the most striking features of black holes, known as jets. 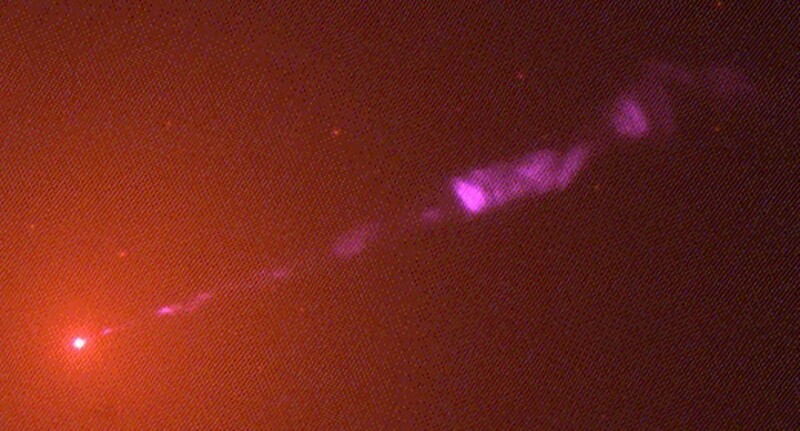 Jets are caused by streams of high energy particles that speed away from the magnetic poles of the black hole. The material is traveling so close to the speed of light that some jets give the illusion of being superluminal. So how does a black hole’s strong gravity and magnetic field cause material to stream away from it at high speed? It has to do with the fact that the magnetic poles of a black hole are where the hold on ionized gas is the weakest. Both the black hole’s gravity and its magnetic field continually try to squeeze material into the black hole, but when material reaches the polar region the intense pressure and energy of the surrounding plasma can send stuff flying. It’s similar to the effect of squeezing a watermelon seed between your fingers. Squeeze harder and harder, and eventually the seed can pop out of your fingers and shoot away at high speed. So while the black hole itself doesn’t emit light, the surrounding material is driven by the black hole to emit lots of light and stream jets away from its poles. Of course electric universe fans will argue that these x-ray sources and jets are proof that”everything is plasma” and that attributing these effects to a black hole is just astronomers trying to fit a square theory into round data in order to preserve their dogma. Of course what they ignore is the fact that we see similar effects with neutron stars, so we know that dense masses can drive the formation of jets and intense x-rays. We also know that a supermassive black hole exists in our own galaxy from its gravitational effect on close stars. Then there’s the fact that black holes are a prediction of general relativity, which is experimentally confirmed every day. Then again, many EU supporters don’t accept general relativity either, but that’s a whole ‘nother story. The point is that while black holes can capture light, it doesn’t trap everything. Long before matter reaches that point of no return it is heated, ionized and squeezed so that it is quite luminous in many cases. Nothing but a supermassive black hole can drive that kind of intensity. do we have experimental evidence of Hawkins radiation? because the whole paper will fail if hawking was wrong.